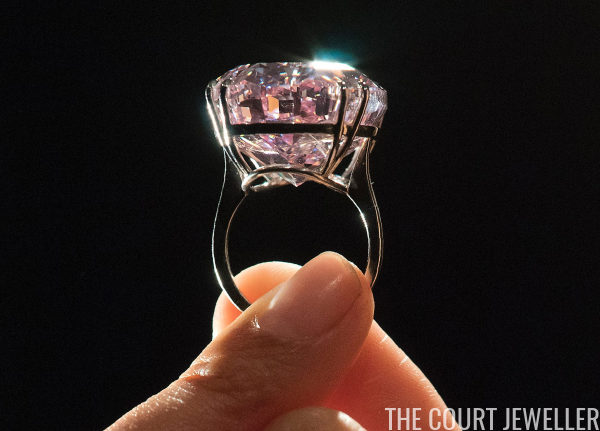 The diamond, which was found in South Africa in 1999, was originally known as the Steinmetz Pink, after an billionaire Israeli diamond merchant. 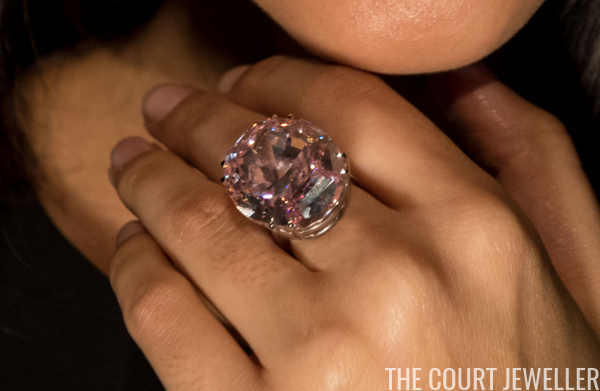 The diamond was so rare that it took twenty months to shape the stone from its 132.5-carat rough form to its present 59.60 carat mixed oval brilliant cut. The faceted and polished diamond was unveiled to the public in Monaco in 2003, and it was included in a major Smithsonian exhibition, "The Splendor of Diamonds," later the same year. Actress Jenna Elfman wore the diamond as a pendant on a necklace at the opening of the exhibition. After its inclusion in the exhibition in Washington, D.C., the Pink Star was sold several times. Most recently, it was offered by Sotheby's Geneva, where it fetched $83 million. 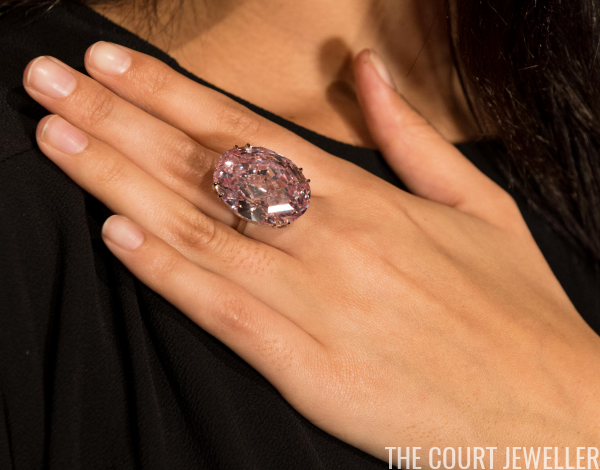 The buyer was Isaac Wolf, a diamond cutter from New York; however, the post-sale financial transactions were not completed, and the Pink Star was returned to Sotheby's inventory. Now, the diamond will be sold again, this time at Sotheby's Hong Kong. The firm announced on Monday that the Pink Star will be sold on April 4, and the auction estimate has been set "in excess of $60 million." The diamond is currently in a ring setting. The press materials released by Sotheby's ahead of next month's sale describe the diamond as follows: "The Pink Star has received the highest colour and clarity grades from the GIA for pink diamonds and has been found to be part of the rare subgroup comprising less than 2% of all gem diamonds - known as Type IIa: stones in this group are chemically the purest of all diamond crystals and often have extraordinary optical transparency. Mined by De Beers in Africa in 1999, the 132.5-carat rough diamond was meticulously cut and polished over a period of two years and transformed into this stunning gemstone. 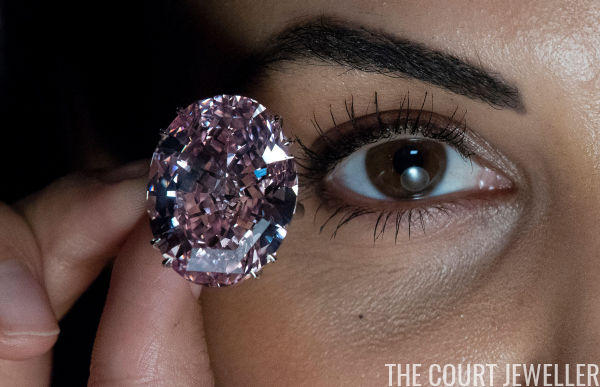 According to the records of the GIA Laboratory, the Pink Star is the largest Flawless or Internally Flawless, Fancy Vivid Pink, Natural Colour, diamond they have graded in a letter issued in April 2016."